Advantages: Interesting subject choices; includes national markings and stencils; comprehensive instructions and helpful notes; high quality decals printed by Cartograf. 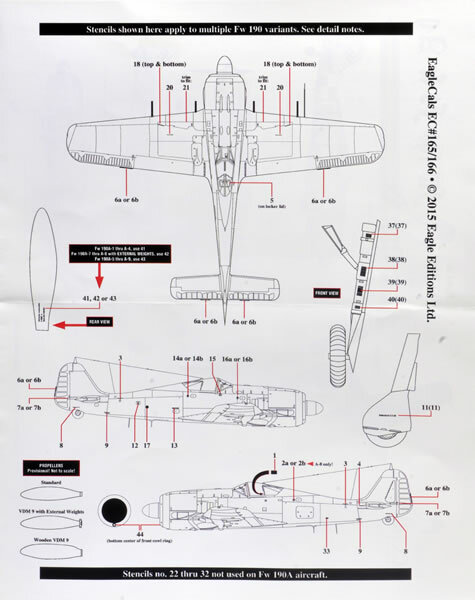 Conclusion: These decals will offer some interesting choices to customise any 1/32 scale Focke-Wulf Fw 190 F-8 or A-9, but in particular the new Revell Fw 190 F. There are a number of interesting and unusual options on this sheet. As always, a high quality offering from Eagle Editions. Highly Recommended. 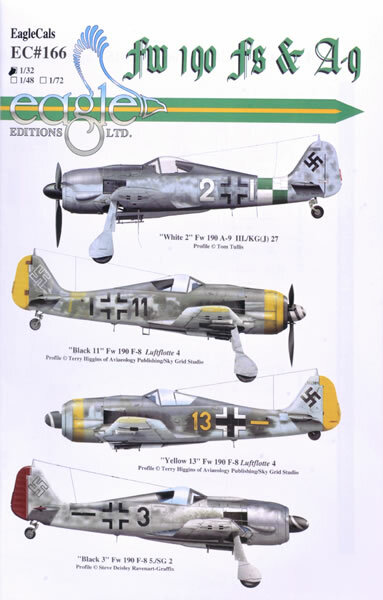 Eagle Editions has released a new set of decals that will be ideal for Revell's recent 1/32 scale Focke-Wulf Fw 190 F-8 kit. The decals are beautifully printed by Cartograf and in perfect register. 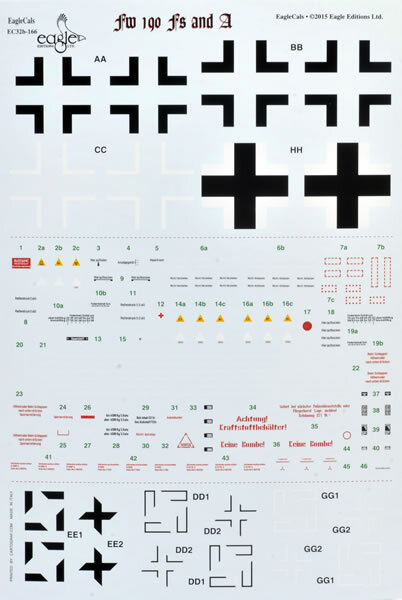 Two sheets are offered here, including all the nececessary unique numbers, werknummern plus national markings. The instruction artwork features finely reproduced side view halftones, weathering plus realistic depiction of light and shade. The large versions of these illustrations are very attractive indeed. Upper views of all four subjects are also included. In common with earlier EagleCals releases, the research behind these decals and the artwork is first class. 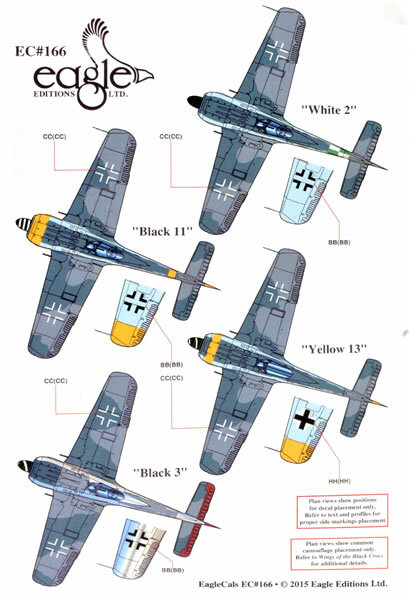 In addition to the colour marking guide, a helpful text description of each aircraft is provided noting the unit and details of camouflage and markings. A full-page stencil placement guide is another useful feature. All aircraft are finished in RLM 74 Grey Green, RLM 75 Grey Violet and RLM 76 Light Blue lower surfaces except Black 3, which features bare metal lower surfaces. The decals are also available from EagleCals in 1/48 and 1/72 scales. The instruction advise that the most noticeable difference between the 190 F-8 and F-9 is the enlarged cowl ring fitted to the latter. It has also been believed that the 190 F-9 was fitted with a 14 blade cooling fan. However, new evidence reveals that this enlarged fan caused a significant performance reduction. Therefore, the earlier 12 blade could have been maintained for better performance. Some additional work will be required to convert the Revell kit to an A-9. If this is your preferred subject, the Hasegawa Fw 190 A-8 would be an easier place to start. 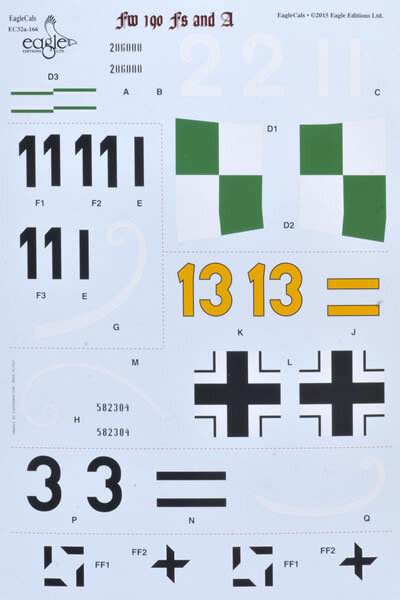 These decals will offer some interesting choices to customise any 1/32 scale Focke-Wulf Fw 190 F-8 or A-9, but in particular the new Revell Fw 190 F. There are a number of interesting and unusual options on this sheet. As always, a high quality offering from Eagle Editions.